Donzaleigh Abernathy, the daughter of the late Rev. 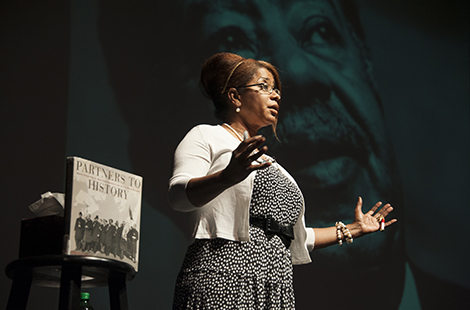 Ralph David Abernathy, offered personal insight into the lives of the men who led the civil rights movement, during a presentation as part of CSUN’s Black History Month celebration. Read more about the presentation. The Student Health Professionals Pre-Entry Program has provided a support system for hundreds of CSUN students on their way to the medical field. Read more about the program. Superior Court Judge Randy Rhodes received special recognition for his many years mentoring future attorneys. Read more about Rhodes. Thu., March 5, 7 p.m. Sat., March 7, 8 p.m.
Wed., March 11, 9:30 a.m. Please join CSUN Athletics for a pregame lunch at the new Sand Volleyball Courts prior to the game on Thursday, March 5 from 11:45 a.m. to 1 p.m. RSVP to Fatema Noor at fatema.noor@csun.edu or call (818) 677-5081. Shaun R. Harper, a national expert on equity and student engagement in higher education, will serve as the keynote speaker at CSUN’s annual Terry Piper Lecture in the University Student Union’s Northridge Center. This two-part mindfulness series is designed to be both informative and experiential, and will provide participants with a basic understanding of what is meant by “mindfulness” and how to incorporate mindfulness into their everyday lives.